REFUGEE advocate Tim McKenna says he was honoured to join about 3500 people at the annual Palm Sunday ACT Refugee Rally. “The numbers were greater than last year despite inclement weather,” he said. Mr McKenna says he was pleased with the Catholic response to the day. “Pat Power, retired auxiliary bishop of the Archdiocese, co-led the march, while a number of Vinnies banners were prominent during the rally and the subsequent march through the city,” he said. 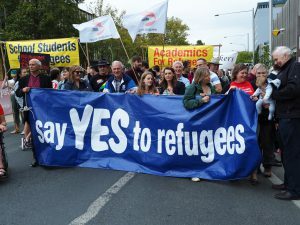 “In the lead-up to the rally, churches, schools and organisations (including Catholic ones) put up advertising banners which we are most grateful for.